To download the latest issue of 1st News just click here. We can’t be complacement, we have to keep up the fund-raising to enable us to equip the New Scouting Centre to an appropriate standard. 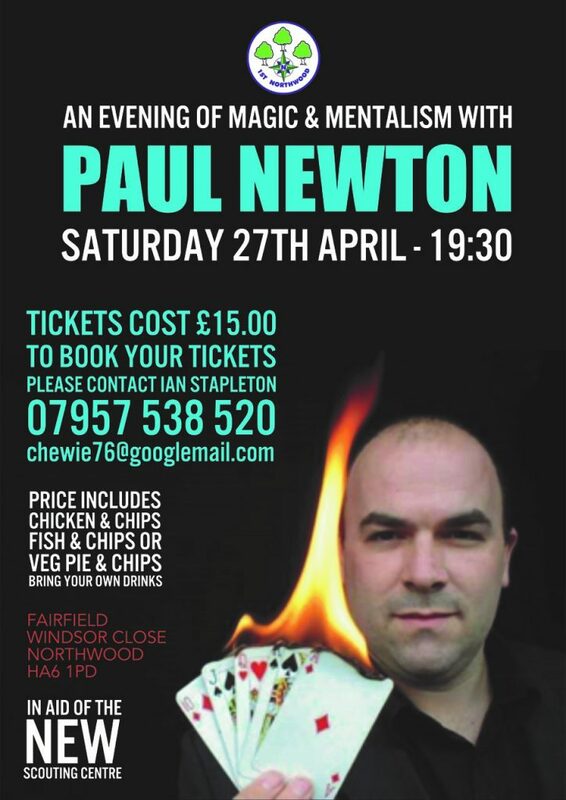 Book now for an evening of magic, mentalism and more! 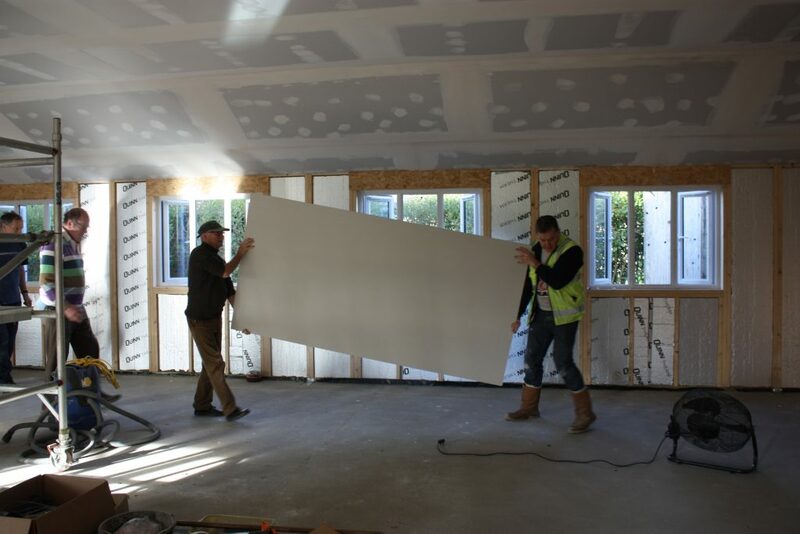 40% of the 100 or so panels of plasterboard have been fitted by us, at three all-day working parties – it’s got a lot of walls, especially when you have to fit to both sides of the internal partitions! Imminent works include rainwater drainage and landscaping starting on Friday 1st March; flooring has been ordered and will be fitted to kitchen and toilets week beginning 11th March – we have to finish painting walls and ceilings in those rooms by then. The electricity will be reconnected on 6/7th March. Lots to do! 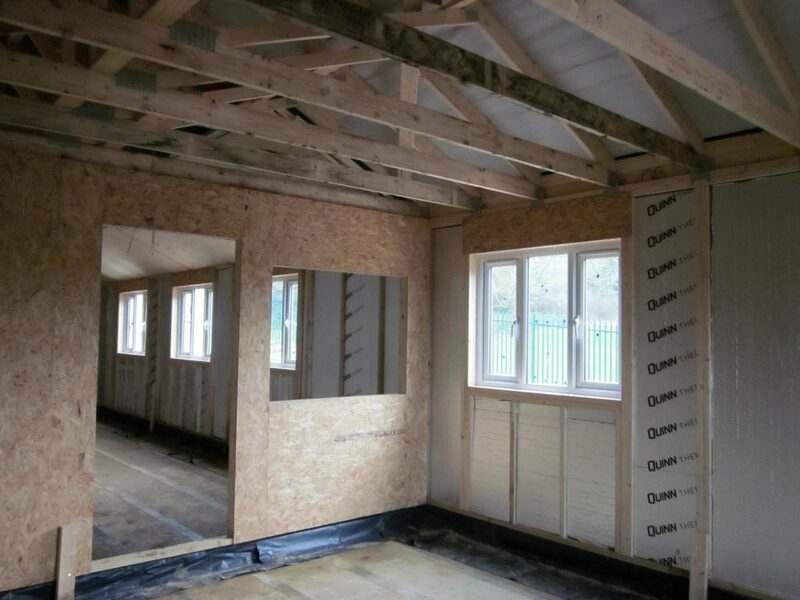 Thanks to the large band of volunteers who gave up some of their Christmas break, the new building has insulation fitted in the walls and roof. The next major milestone will be the floor screed, starting on Monday 7th January. We will have to leave the screed for at least 2 weeks to set before we can walk on it. After that Passmores will return to finish doors, windows and other bits and pieces. Then we can start cladding the walls, installing electrics and plumbing etc – there’s still a great deal to do! We’ve kept saying that the plan showed we would have the roof on the new Scouting Centre by Christmas. Well, guess what? We did it with 3 days to spare! The roofers finished at 9.15 this morning – they made a 7.30am start so they could get an “early go”. Well, it is the shortest day of the year. The latest newsletter from 1st Northwood Scout Group is ready to download, just click here. Geostructures completed the foundations on target on Friday 16th November, and then spent three days in our “contingency” week tidying up the site. 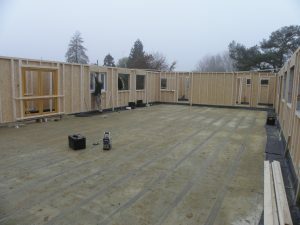 Passmores came to site on Monday 26th, erected all the walls and partitions, glazed them all, and left site again on Tuesday afternoon. Wow, how fast was that! Next week we have a scaffolder coming on site to put scaffold all round the structure, so that Passmores can put the roof trusses on. And we should have a roof on by Christmas. But don’t expect a Christmas Party in there, lots of work still to be done. Remember we reported on the local bikers’ Fun Day back in August? Well, on Friday 26th October they invited us to meet them at The Gate pub to receive their donation to our New Scouting Centre fund. 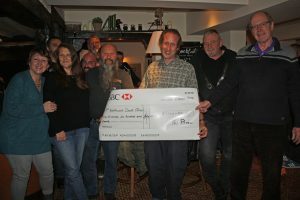 In the photo you see Doug Horgan and Richard Plume being presented with a cheque for £1,643 by Nick. In addition, one of the Posse members, Jackie (far left), passed on a donation for £500 from her employer GSK. Thank you everyone! At last, we can see what’s going on! 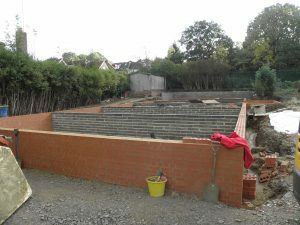 They have now completed all the brickwork and blockwork to bring the foundations for the new Scouting Centre up to a single level. 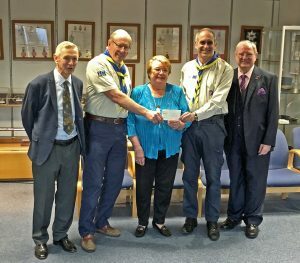 On 22nd October 2018, Paul Akers, Richard Plume and Leo Mindel were delighted to accept a cheque for £30,000 on behalf of 1st Northwood Scouts. This was our share of the funds raised by Cllr Carol Melvin for her three charities during her term of office as Mayor of Hillingdon 2017/2018. Thank you, Carol – a great result!